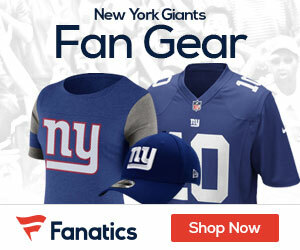 « Raiders Release Boss; Giants Interested? A well-built, athletic looking tackle prospect with a long set of arms and a naturally thick lower half. Has the frame to continue to add weight and naturally fill out. 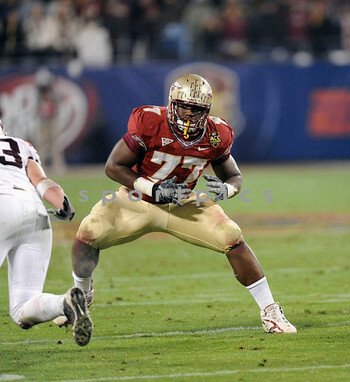 Has played both on the right and left side during his time at Florida State, but has the majority of his experience at right tackle. Coils up into his stance well, and is a natural bender who is quick off the ball in pass protection. Possesses good range off the edge, he doesn’t have elite edge range, but stays compact on his kick slide, can stay with speed rushers and extends his arms well into contact. Is very balanced and coordinated extending his arms. He keeps his base down through contact, gets inside the chest plate of the defender and exhibits the shuffle and slide ability to mirror through the play. Is very fluid/coordinated laterally, especially when he gets his hands on a target. However, too often/easily can be overwhelmed on contact initially. Get overextended often in order to make up for his lacking anchor strength and gives up a softer edge. Showcases natural range out of his stance in the run game. He fires off the ball low, but does waste some motion into contact winding his arms, and can be slow to gain leverage. However, he does a nice job breaking down on contact at the second level, can pull from the backside and exhibits good range in the open field. He does fall off blocks at times through contact when trying to create a push. Is a heavy-handed guy who is a good slide down blocker, but at times gets a bit confused on who to block and only displays average awareness. Nevertheless, he exhibits the ability to reach off his frame, chip and then hit another target at the second level and has the skill set to excel as a run blocker, as he possesses the lower half make-up to add even more strength and become a very solid power player. Awareness gets him in trouble at times off the snap, and has had a number of false starts/holding calls made on him. Should improve as a senior. Impression: A natural athlete who can bend and is athletic. However, struggles with power and makes too many lineman look like good pass rushers toward the edge because of it. Needs to get stronger to have a chance. Athletic OT who has experience at both tackle spots while in college…has good natural athleticism which allow him to run most speed rushers out of the play…gets good depth on his kick step and slide well laterally to mirror the rusher…very aggressive when asked to run block…does a good job attacking his man and working to overwhelm him at the point of attack…plays with heavy hands and delivers a solid punch that is able to stun the rusher…has ideal size and long arms for the position…does a good job bending his knees and staying in his stance v. the rush. Is not effective when asked to block in space…at times can appear to be lost about who to block and where…is a more comfortable blocker when asked to block the guy in front of him…doesn’t use his punch as efficiently as we would like and has at times over extended himself trying to land it…he can get popped out of his stance by a good bull rush and struggles to re-anchor…will struggle to hold the edge v the elite speed rushers who can explode off their first step…could have been flagged for a few more holding penalties from the tape we saw…He’s a good athlete but too many questions exist about how he will handle elite speed rushers to make us trust him as a definite LT.
Sanders is one of the most experienced game players in college football, as a four-year starter at Florida State. He started 10 games as a freshman, 12 as a sophomore, 14 as a junior, and so far every game during his 2011 senior campaign. The Dayton, Ohio native even began as a left tackle in his first year, moved to right tackle for most of the rest of his tenure in Tallahassee, and now he finds himself back at left tackle as a senior. Sanders is the rock of what has been an injury-plagued offensive line. Behind Sanders and company, Florida State boasts the No. 3 scoring offense and No. 2 passing offense through nine games this season. Sanders is a huge presence at 6’6” and 307 pounds. He generally runs in the 5.20 range in the 40-yard dash and has been clocked as fast as 5.12 from that distance. He has a quick feet for a man of his size and that suits him for the left tackle position because he can deal with fast defensive ends. There is room for Sanders to add some bulk to his tall frame and he will have to do that as he heads to the next level. That will help him improve his explosion off the ball and win the battle at the line of scrimmage on running plays. Sanders projects as a third-round selection in the 2012 NFL Draft. Zerbie Sanders is a tall, athletic tackle prospect. Can play both sides. Good height. Long arms. Fluid in his movements. Pretty aggressive. Needs to bulk up and improve his awareness. But a nice skill set to work with. Other than the top tier of tackles, there aren’t any plug and play guys. Sanders is no exception. He needs to hit the weight room. He needs to work on some technique. He needs to improve awareness. But he’s a physical guy who can move and is super athletic. 2nd or 3rd round pick. Again, won’t play right away. But has the talent to turn into a starting left or right tackle down the line. I really like this player after doing some research on him. I think I would put him at ROT and let him play. He has a lot of upside but I don’t see him as a LOT.